He is of the Republican Party of old, who were the first, Independent Party of our history. Ron Pauls ideals came from history. BTW, he's labeled crazy, because he scared some really important people. If more Americans followed him, our government would be in a world of hurt. So, it's best to say---there goes crazy uncle larry again. Ron Paul scared no one. Quit trying to play the fear card. It didn't work during the election, and is not working any better now. Ron Paul would have been beaten more badly than Romeny was. He would have come-off as the 'village idiot' during a general election campaign. Yeah, Bernanke doesn't comprehend even the rudimentary aspects of a successful economy -- but you do. How's the economy sport? Results don't matter to you I guess but you keep on trying to tell me you and Bernanke know better even though the economy is in the dumpster. Your are also wrong when you say, "you want consistent slight inflation or deflation." No, you never want deflation. That is a downward spiral that drives the economy into depression. You made that up and no proof. It's a good thing when prices fall faster than wages or wages rise faster than prices. Purchasing power matters. Confusing to those with little to no economic common sense. You can look at the last decade but I look at the last 150 years. The economy is far more stable under the Fed than the previous period of wild boom and busts and sharp inflation and deflation. LMAO The worst economic times, AND the wildest swings have been caused by the fed and you think the opposite. Doesn't surprise me considering the hacks you follow. Modern times with modern technology makes recoveries faster. The reason they don't come fast is when the economic "scholars" try to manipulate the economy even more. We went through a depression that saw unemployment go from 12 to under 4 in two years for the sole reason government didn't try to fix it and let the free market be the judge. Then a decade later the Federal Reserve manipulates interest rates, causing the mal investment which led to the worst economic times in the last 100 years. Keep backing failure and you'll get more of the same. 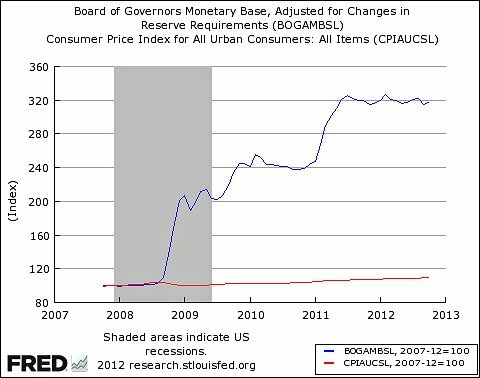 Inflation IS the increase in the money supply. That is where is starts. The hacks who think otherwise have tried to change the definition to cover their tracks in order to fit their twisted agenda. Up is down to them. These are the same amateurs who use cherry picked charts and think the economy was good during the war which goes against every basic economic principle. Why listen to those people? They didn't see the housing boom and bust early on. They have no credibility. Monetary inflation is the increase in the money supply. Plain and simple. Nothing else. No idiotic charts proclaiming 1 and 1 is 3. Inflation relates to prices. Why you think inflation is an increase in the supply of money is because GENERALLY an increase in the money supply is inflationary. LMAO no it is NOT generally. It is ALWAYS. When the money supply increases prices rise. Inflation doesn't relate to rising prices it is the catalyst that makes them rise. Increase the money supply, prices rise in that order. An increase in the money supply is inflationary. Your man Bernanke is the one who controls the interest rates. The sky is blue where I am but I'm sure you'll come along and tell me it's black and how an eclipse where nothing grows is good for me too. I won't listen though. Why listen to the ones who didn't see the Housing collapse coming when anyone with the slightest bit of business acumen could have told us. btw the Austrian Economists specifically addressed that in 1979 and lo and behold they were right again. "Austrian School economists generally argue that a lack of investment during periods of low interest rates are the result of malinvestment and time preference instead of liquidity preference." Interest rates below market encourage mal investment. The Great Depression, the dot com bubble, and the housing bubble proof enough or do you need more proof? That's price deflation from 1865 to 1900. So, by what you say, that means the economy was driven into a recession for those 35 years. I know, I know, you will call it the Gilded Age, and there were a lot more super-rich people. However, if you look further down that file, inflation adjusted GDP per capita increased from around $600 to $5000 in that 35 year time span. I wouldn't consider that a depression. Actually, that was the fastest % growth in our history. And it wasn't just rich people, everyone's standard of living went up quite a bit. Otherwise, so many immigrants wouldn't have come here during that time. Agreed. Post Civil War saw a huge economic growth, but the Keynesians will tell us they were bad times. The only village idiots are the ones who think doing the same thing over and over again will yield different results. So tell me oh wise one full of "knowledge". Which policy would Ron Paul been raked over the coals with? His economic policy which told us to not regulate Housing or there will be a big crash? Or the time he said our foreign policy of invade and occupy would make us less safe which the Dept of Defense and CIAs Bin Laden Unit reports backed up. So which is it? Which policy was so bad that he'd look like the village idiot? Or do you just like making all encompassing vapid statements without being able to back them? Why listen to you? Your big government candidates policies are known failures. Ron Paul isn't the village idiot here. Speaking of fear tactics, which YOU fell for since YOU need big government to protect YOU from your fears. Them Mooslims are going to get you. We better occupy their countries so we can control them. The economy is going to crash completely and we need bailouts and quantitative easing to save us. Maybe you're not running scared, maybe you're just uninformed. Wake up! A couple of things, because I'm not going to spend much time on this, in times of deflation both prices and wages fall. That's what happened in the Depression. The only problem is that if you had a mortgage, the bank still wants the monthly payment, even if prices and your wages fell. Since labor is a large component of prices, the situation when wages stay the same and prices fall is near nil. Wage stickiness is however good, because it stave off destructive deflation. Conservatives have been predicting that hyperinflation since 2008, so where is it? The last five years, with huge expansion of the Fed balance sheet, very large deficits, etc. has been a total rejection of the Austrian model that has been decisively wrong. Yet, some people turn to their ideology and ignore indisputable evidence -- worse, they attack the evidence that completely undoes their ideology. Incorrect once again. IF prices fall faster than wages or IF wages rise faster than prices THEN the slight deflation or inflation is acceptable. Purchasing power is what matters. Hello? Reality is truth. Re writing the definition to fit a twisted agenda is not. Your chart says we aren't in a recession anymore. What made up definition in order to appease the masses are you using? How about purchasing power and overall percentage of workers? or is that too hard to manipulate? Sorry you don't get to speak for conservatives. Do you even understand the difference between mass or large inflation compared to hyperinflation? The last five years, with huge expansion of the Fed balance sheet, very large deficits, etc. has been a total rejection of the Austrian model that has been decisively wrong. Because you said so and have nothing to back it up? You're wrong too often. The Austrain model, in a nutshell, is let the free market work. We haven't done that, we've stagnated, There has been no recovery. Just like FDRs decade plus long depression when the Keynesian model failed yet again. We see it in the way the Housing market is still being manipulated. If we used the Austrian model the foreclosures would have been released, the market would have hit bottom and housing prices would be climbing and not propped up artificially like they are now because someone said they should. Artificial describes Keynesians to a tee. Why comment when you don't understand the Austrian model. Course you don't really understand successful economics or you wouldn't be backing the same plan used in the Great Depression. How'd that work out? Yet, some people turn to their ideology and ignore indisputable evidence -- worse, they attack the evidence that completely undoes their ideology. You haven't provided any evidence. Just rehashed the same garbage where you never delve into the inner workings. Changing the base lines and ignoring quality, while rewarding failure is your flavor not mine. Real median earnings of both men and women who worked full time, year-round declined by 2.5 percent between 2010 and 2011. The rates of decline for men and women were not statistically different from one another. 10/4/12 - The largest increases were for dairy products, which rose 7 percent in September, their sharpest climb since January 2011. Higher feed costs were a major factor in the increase, and also helped to drive meat prices up 2.1 percent, especially in the “grain intensive” pork and poultry industries, the report said. This has been caused by the worst tax of all, the inflation tax. YOUR economic savior, Ben Bernanke, is the one responsible. Tell me again how things are working out fine. Tell me again the recovery is working and things are looking up. Use some neat charts with made up definitions and ever changing goal posts so I can feel good. Tell me some lies so I don't have to think about the truth. You fail to understand what you are reading. Falling median family income is not a reflection of inflation. Median family income fell because of increased poverty and increased income inequality. After rising for three years, neither the number of people in poverty nor the poverty rate was statistically different in 2011 from the prior year, Census said. Meanwhile, real median household income decreased 1.5% to $50,054 in 2011, and a measure of income inequality increased on an annual basis for the first time since 1993, Census reported. Median income last year was down almost 9% from a recent peak in 1999, and is lower than when the recession began.